Kitty cats–in all of their sweater-wearing, obese, gluttonous glory–are symbols of the unbridaled, viral web. So a cartoon feline is a fitting symbol for the band of digilantes behind the just-launched Internet Defense League. Members so far include Mozilla, Reddit, and Imgur. The League was created by Fight For The Future, the organization that created blackout tools for websites during the SOPA/PIPA online protests last year. Anyone with a piece of the web to call their own–from a blog to a YouTube channel to a Twitter stream–can sign up to join the League. In return, they’ll receive a bit of code for a “bat signal”-like alert they can post on their own websites to raise conjoined awareness anytime legislation pops up that the League or Fight For The Future (and probably Google) believes will threaten freedom–or at least free stuff–on the Internet. 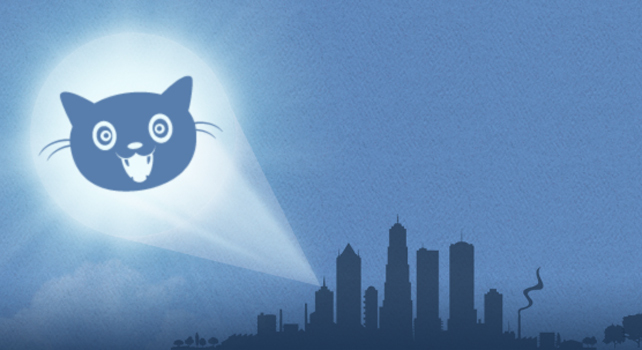 And, just in time for the midnight premiere of The Dark Knight Rises, the League is currently crowdfunding money to shine giant “cat-signal” floodlights in cities around the world, bringing its online message to real-world streets. For more news like this, visit our main Fast Feed page regularly.